We apologize for the issue being extremely late. The editor’s computer had an irreparable meltdown following production of the September-October issue, corrupting a number of data files on an older backup drive. A new Mac and backup drive are now in place. The issue includes a number of short articles, including “Flyspecking the First Christmas Stamp” by Robert W. Lighthouse; “Who Ws Charles Jewtraw” by Glenn A. Estus, who found a postal card related tot the first person to win a gold medal in the first Olympic Winter Games in 1922; and Steve Swain explores the relationship between aviator-signed covers and postal history. The featured video details the inaugural run of the New York Central’s Railroads’s Empire State Express, which occurred on December 7, 1941 — the same day that the Japanese bombed Pearl Harbor. George McGowan’s Mail Bag column details covers issued for the train’s first trip. 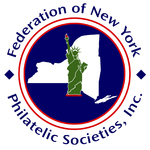 Three groups in Pennsylvania are now contributing club pages — the Pennsylvania Postal History Society, the Lancaster County Philatelic Society, and ghe Wymoming Valley Stamp Club of Wilkes-Barre. The current issue has nearly depleted our resources. We welcome your submissions. I found a few interesting articles. Looking forward to next issue.